Light, safe and stable are the basis of the Eddyline Sky 10'. At 32 lbs you'll find the Sky 10 as easy to get on the car as it is to carry down to the water. The dual bulkheads and hatches mean you've got a 10' recreational kayak with all the inherent safety of a true touring boat. And the 26" of beam mean you'll probably never need it. The Eddyline Sky 10 even looks like a touring boat. On the water this little boat is nothing but tracking and glide. So unlike other little rec kayaks, you won't look like you're paddling an obstacle course every time you get on the water. And just like the bigger boats in the Eddyline family, the Sky 10' is manufactured to the highest standards of quality and excellence of any thermoformed boats available. Suited for a small to medium sized paddler. $99 Kayak, Canoe or Stand Up Paddleboard Shipping: For $99 Clavey will ship your kayak, canoe or SUP to the nearest Distribution Center of the shipping company. Typically this will be in the nearest large metropolitan center to your home. Clavey will contact you with the location and date of arrival as well as contact information and hours of operation. $149 Residential Direct Shipping:For an additional $50 Clavey can ship your order directly to your house. 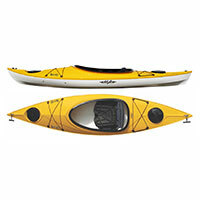 *These prices are per kayak, canoe or SUP and do not include shipping outside of the continental United States. All orders shipped outside the 48 contiguous states will receive a separate freight quote. Please contact us if you have any questions. 10% Accessory Discount:Any accessories (paddles, lifejackets, car racks, etc.) ordered at the time of your kayak, canoe or stand up paddleboard will receive a 10% discount and be shipped with your watercraft at no additional charge. From Dennis S of Twin Falls, Idaho on 8/23/2013 .